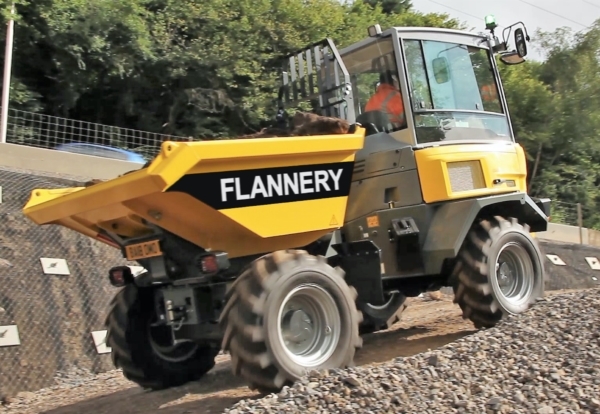 Plant hire specialist P. Flannery is introducing a revolutionary new dumper to the UK that is designed to prevent site deaths from blind spots around the skip. 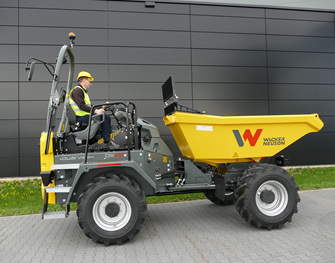 The unique dual view dumper developed by maker Wacker Neuson features a new swivel seat and operator console. This allows the dumper to be driven in a traditional forward tipping mode as well as truck mode with the skip at the rear once the operator’s seat and console is rotated through 180 degrees. 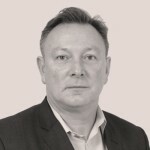 Flannery managing director, Patrick Flannery said: “We aspire to lead the way in the equipment hire industry and feel strongly that the best way to do this is keep people safe and embrace innovation and change as it comes along. He said Flannery had placed an order for 60 six tonne and 9-tonne dumpers, with the first due to enter service next month. “When the dual view range was launched at Hillhead earlier this year it was clear to us that it offers considerable safety advantages onsite. Aside from these advantages the ability to rotate the operator station avoids time-consuming turning and manoeuvring onsite, increasing efficiency and productivity. The DV60 and DV90 dumpers come with operator cabs and features that are more commonplace on diggers and loaders. Flannery machines will also be equipped with rear-view cameras and a proximity detection systems to ensure we have done all we can to avoid blind spots for operators,” he added. 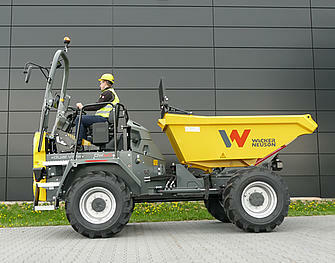 The dual view dumper is primarily designed to operate as a forward tipping dumper. Its enhanced swivel seat technology enables the operator to drive the plant with the skip to the rear, offering greater visibility. The entire seat operating console can be quickly and conveniently changed through 180-degree rotation. The rotation can easily be done from the operator’s seat using a single handle to unlock the seat console and then rotate the console. This always gives the operator a perfect view in the direction of travel – during transport, loading and unloading. When in reverse speed is automatically reduced to further improve safety.